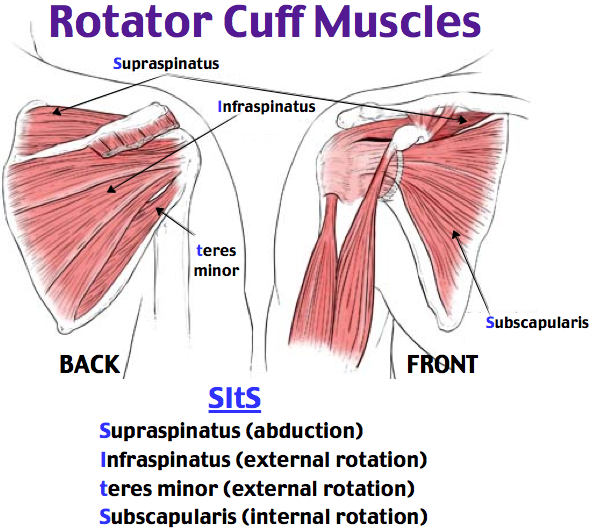 The rotator cuff is an integral part of shoulder function. Injury to the rotator cuff is common. Each year there are approximately 2 million physician visits in the USA due to rotator cuff problems. Further, there are approximately 250,000 rotator cuff repairs performed annually in the USA. Rotator cuff injury causes pain and difficulty with function. Rotator cuff injuries increase in frequency with each decade of aging and are uncommon in teenagers. Patients with rotator cuff tears often report pain. The pain may be activity related—particularly with overhead activity. Pain with rotator cuff tears is often worse at night. Some studies have suggested this association is because the pain receptors in the shoulder are sensitive to pressure—with these receptors sensing more pressure with patients lying horizontal to sleep, as opposed to upright during the day. Advanced imaging such as MRI allows accurate representation of the rotator cuff. 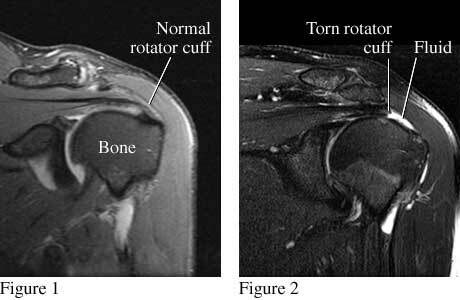 These studies image the rotator cuff and in cases of a tear can delineate the location, size, and any muscular atrophy associated with the tear. 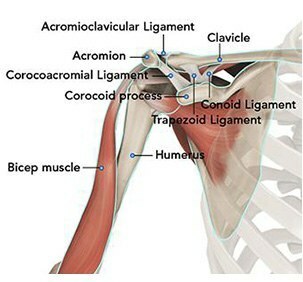 Figure 1 shows a front view of a normal shoulder and rotator cuff. Figure 2 shows a front view of a shoulder with a torn rotator cuff (supraspinatus tendon). Ultrasound may be utilized for rotator cuff imaging as well. The results for this imaging compare favorably with MRI and may be done in a physician’s office. Nonoperative treatment cannot repair a torn rotator cuff. However, pain and function can be improved for many individuals without surgery. For patients with continued pain, a steroid injection of the shoulder joint may be indicated. These injections may be done in connection with mediations listed above. Exercise has proven a helpful adjuvant for rotator cuff tears. Exercise programs can be performed at home or under the direction of a physical therapist–Both methods appear equally effective in studies typically, shoulder steroid injections may be repeated 2-3 times per year. Risks with injection include depigmentation, tendon rupture, and infection. Unfortunately, tears of the rotator cuff not treated will progress and become larger over time. Steroids may mask the symptoms or actually causing tearing to progress. Rotator cuff tears which are not treated may become so large that repair becomes impossible over time. Operative management is indicated for most rotator cuff tears which are amenable to repair. Repair of the rotator cuff can be associated with improvements in pain, function and strength of the shoulder. Effective repairs can be performed in an all arthroscopic fashion. 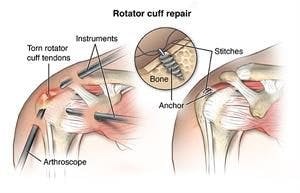 Arthroscopic rotator cuff repair is typically performed as an outpatient surgery. The surgery is typically performed under a regional block and may be accompanied by sedation or general anesthesia. 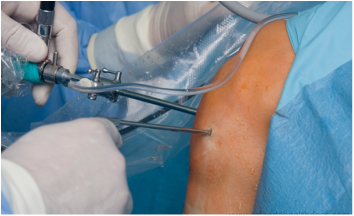 Arthroscopy is performed through poke holes in the shoulder typically no larger in diameter than a pen. The size and location of the rotator cuff tear determines the number of portals, but typically 3 or 4 are required for an average rotator cuff tear. Most arthroscopic rotator cuff repairs are done with sutures attached to plastic anchors placed into the bone. With healing, the sutures and anchors do not require removal. Plastic anchors do not trigger metal detectors at airport security. After surgery the arm is immobilized in a sling to allow for wound healing. Patients report pain after surgery, but the pain generally improves after the second day and utilization of multimodal pain techniques have been shown to improve outcomes for patients. Night pain is typically the most problematic—but multimodal pain programs, heat, and sleeping elevated can improve this difficulty. Many studies have shown that patients can successfully rehabilitate their shoulder on their own at home. Patients are typically guided through a therapy program and weaned from their sling over the first 8-12 weeks. Ingrowth of the tendon typically requires 4 months and patients may return to golf by 5-6 months after surgery. Continued work on motion and strength allows form improvement for up to 1 year after surgery. Results for healing are correlated with smaller tear size, no muscle atrophy, and less lamination of the rotator cuff tear. Significant bleeding from arthroscopic rotator cuff surgery is rare. Other low rate complications include infection and nerve injury.